Future music! 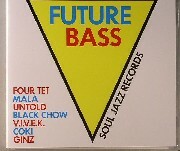 Future Bass! Post-Dubstep, post-House, post everything! Four Tet, Mala, Untold, Black Chow (Kevin Martin/The Bug's latest project), Coki and loads more all-exclusive new tracks on this new album for Soul Jazz Records. Soul Jazz Records have brought together some of the UKs most pioneering producers of the day to create an album that can only be defined as future music. All new exclusive tracks from a set of artists all at the height of their respective careers alongside heavyweight new-wave producers. From the off-kilter hypnotic post-House bass music of Four Tet (one of the most hyped tracks of late) to the boundary pushing genre busting post-Dubstep of Mala and Coki (the two halves of Digital Mystikz), Untold and more alongside truly uniques tracks such as Kevin Martin/The Bug's latest incarnation, Black Chow. Future music! Future Bass! 'Future Bass' is packaged in a limited-edition deluxe plastic casing with set of free postcards and vinyl comes on super-loud, super-heavyweight triple vinyl, mastered at Transition. The album will be followed shortly up by a unique set of twelve inch singles with more exclusive Future Bass tracks from artists featured here - first up, Untold. 01. Mala - "Don't Let Me Go"
02. Four Tet - "Nothiing To See"
03. Untold - "Fly Girls"
05. Ramadanman - "Bass Drums"
06. Black Chow - "Air"
08. VIVEK - "Talking Shadows"
11. Harry Craze - "Gone"
12. Distal - "Grape Donut"
13. Sub Version - "Free To Funk"